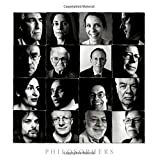 Steve Pyke has gathered one hundred photographic portraits of professional philosophers in this coffee-table book. The black-and-white photographs, taken at close range, creates captivating and sometimes surreal images of this group of esoteric academics. Pyke is interested in rare creatures. His previous books have included portraits of film directors and astronauts. In 1993 he published his first photo book of professional philosophers. Now, a second, in similar style. Pyke's close range tends to slightly distort the faces, amplifying the size of the middle part of the image (usually chin, nose, and eyes). These are raw portraits, exposing wrinkles, random hairs, and crooked teeth (when exposed in the occasional smile). Many of the photographs are taken on a dark background, with natural light striking the face from one side. The effect is eerie: from the light on the eyes, the face blurs back into blackness. Photos are printed on the right sides of the opened book, which leaves plenty of blank space on the left sides. This blank space nicely frames the dark photographs on the right. The left sides include short passages in which the photographed subjects describe what they think philosophy is or why they became philosophers. This will be interesting to both academics and non-academics. Philosophers are notorious for self-reflective concern about the nature of their profession. What is philosophy? Is what we do valuable? What are the best methods for addressing our questions? Some give a charming view of the profession: "philosophy is the transformation of one's understanding of the world and everything of value within it by means of reflection on the nature of human life, the findings of science, and the great ethical, social, and artistic achievements of humanity" (Malcolm Budd). Others are cynical: philosophers "get to go to as many faculty meetings as we like at no extra charge" (Jerry Fodor). For non-philosophers, the book provides the opportunity to bring artistic depictions of a rare and strange group of people into their homes. For professional philosophers, perhaps especially the younger ones, the photographs will be interesting, since many of the portraits are of people otherwise known only as a byline on published papers. One of my favorites is of Judith Thompson. Never having seen Thompson in the flesh, I was struck by her spright and smile, which seems barely to conceal her pleasure in having caused so much trouble for so many students who once held a view that her brilliant thought experiments helped change. Nevertheless, it is hard to shake the feeling that there is something superficial about this enterprise. More so than most professions, what makes a philosopher interesting is the activity of their mind expressed through conversation and the printed page. These are people who have spent thousands of hours, alone -- with books, scraps of note paper, and keyboards -- pursuing problems of broad importance with severe rigor and arcane detail. It is tempting to think that this intellectual activity might be etched onto their faces. Sparse smiles, bony jaws, bushy furrowed brows. Men, bearded and frumpy. Women, serene and reserved. In his introduction to the book, Arthur Danto, himself a philosopher whose photograph is printed here, succumbs to this temptation. These photos expose "the dense concentration of the philosopher … to turn the pages of this remarkable album is to experience the look of deep cogitation as a mode of being." But I reckon this temptation is not grounded in much. A random collection of plumbers would look similar. Indeed, Pyke's photographs of astronauts and film directors, samples of which can be found on his website, are essentially indistinguishable from those of the philosophers. When asked about my profession, my answer (academic philosophy) usually baffles my interlocutor, who often respond by somehow rephrasing the question: So what is it that you do? In another review of the book Cynthia Freeland notes that this book will do little to answer such questions. Pyke's style -- close shots of the face -- leaves out everything about philosophical work. Contrary to what my neighbors must think about what constitutes a hard day's work for philosophers, the effect of Pyke's style is to neglect everything of substance and interest about us -- most philosophers I know, and surely most who are photographed here, are absolutely consumed by their work. Only the photo of Michael Friedman standing in front of a chalkboard places a philosopher in a worklike setting. On the other hand, this photo more than the rest smacks of cliché (pensive scholar in front of chalky scribbles, staring into the distance). The inside cover claims that these portraits "feature virtually every major philosopher working in the West." This is false. Pyke includes hardly any philosophers employed by institutions in Canada, Australia, France, Germany, the Netherlands… Academic philosophy is a small world, but not that small. However the book does accurately represent the low proportion of women in academic philosophy (roughly 1 in 5) and of racial minorities (this is impossible to discern based on the photographs, but I count no more than three visible minorities out of the one hundred photos). What then is the appeal of this coffee-table book? Like others of its genre, it is pleasant to look at. Many of the photographs are beautiful. And, like others of its genre, it will help initiate conversation. Younger philosophers will look for their doctoral advisors. Brandom's beard will get attention, as will Field's grin, which Freeland describes as maniacal. But there is something more profound about these images then mere circus curiosity. Despite my suspicion of the temptation expressed by Danto, Pyke's artistic genius is to defy such suspicion, to nevertheless tempt the viewer into photographical phrenology, into seeing intellection on the printed page. To take one example, Richard Arneson's statement about his work -- "What conception of social justice makes the most sense? I have always resisted answers that suppose a society could be just and fair independently of whether or not its members are leading genuinely good lives" -- is visibly expressed by his tight-lipped, incisive stare, probing the viewer to ask am I leading a genuinely good life? Jacob Stegenga holds a Banting Postdoctoral Fellowship at the University of Toronto. His website is: individual.utoronto.ca/jstegenga.